Envisions a Wholesome, Advanced, Vibrant, Equitable, Sustainable (W.A.V.E.S.) Cebu in 2050. 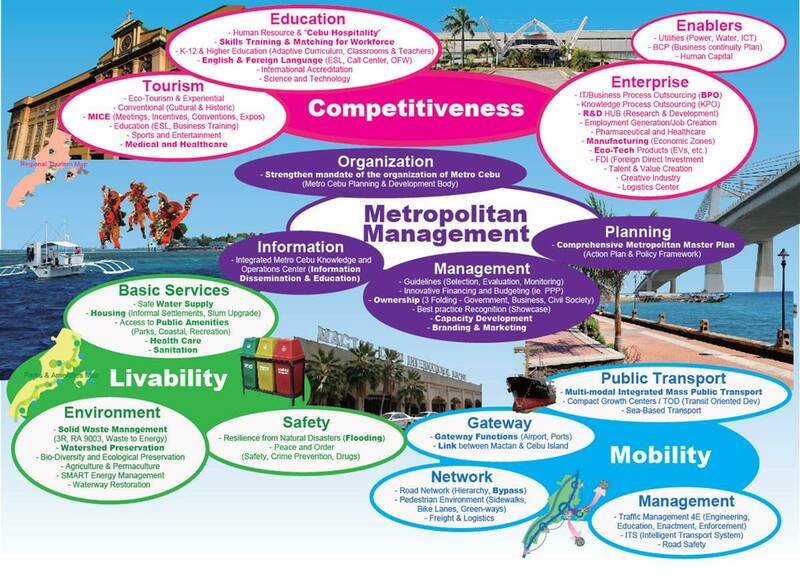 Promotes long-term and collaborative planning and action towards a more sustainable city-region. the population of the entire ‘province’ or ‘island’ in the year 2050 – which is projected to reach 12 million (noting the ‘technical’ definition of a mega city population which is 10 million or more). A concept promoted and program spearheaded by the Metro Cebu Development and Coordinating Board (MCDCB). A vibrant, equitable, sustainable and competitive environment that embraces Cebu’s creativity and its cultural, historical, and natural resources, with strong citizen participation and responsive governance. Cultural & Historic – The fusion of a vibrant, modern and sustainable environment that embraces Cebu’s creativity and its cultural, historical and natural heritage, with a sense of identity and belonging. Innovative, Creative & Competitive – A proactive, adaptive, effective and quality educational system & globally competitive business environment that maximizes key economic drivers and livelihood opportunities. Inclusive, Equitable & Livable – A developed, responsive and efficient physical and social infrastructure that provides safe, secure and healthy living environment for all members of society. Interconnected & Compact – Physically, economically and socially integrated Metro Cebu communities where individual growth areas are compact and walkable. Green – Sustainable and resilient development that preserves and nurtures the unique natural environment. Integrated, Coordinated &Participative – A strong citizen’s participation and collaboration together with responsive and accountable governance that identifies, plans, and delivers integrated solutions.